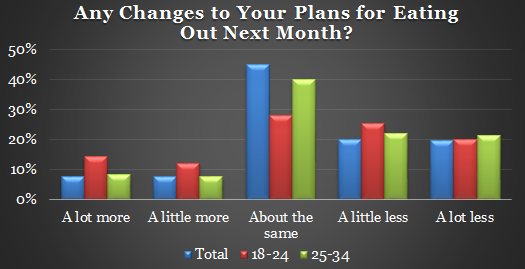 Men & the young are back in the game with a sharp increase in plans to eat out during the upcoming month relative to last month. 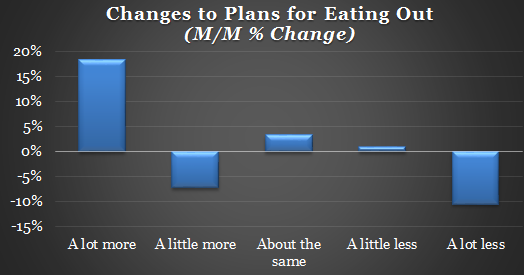 In any case, RR's latest monthly survey continues to reveal an overall negative bias towards consumers' dining plans - suggesting that value should remain front-and-center. Having said that, Del Taco's 3Q18 results teaches that brands must be careful about deal fatigue which can drive trade-down of existing customers without helping to boost incremental traffic. A positive change in this month's survey can be easily explained by the percentage of total QSR value promotions (as a % of total promotions) which is at the highest level in at least 21 months. This high level can also explain increased deal fatigue as previously discussed. Resultantly, only brands with the greatest share of voice are poised to translate deals into incremental traffic. FSR has backed-off slightly in terms of value and is currently at its 21 month average (total value/total promotions) although lower priced deals ($7 & under) currently represent the lion's share of total value promotions.